I'm not sure if I will be joining or not. I havnt decided if I want to put my cinecolor texture pack that I've been developing on hold or not. 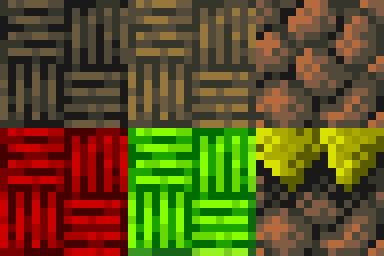 However I was bored today so I decided I would make a few textures with this palette to see how it turned out. Here it is! It may make your eyes burn, but atleast it's creative. In my opinion it looks kind of nice too(although very busy). If I join, I think my pack will be named carnival. I like it, but I do believe it would look nicer without the yellow... In my opinion of course! As Sam said, the yellow is a bit out of place, but it looks really nice otherwise. I actually quite like it! I think the yellow is nice...what blocks are those, btw? 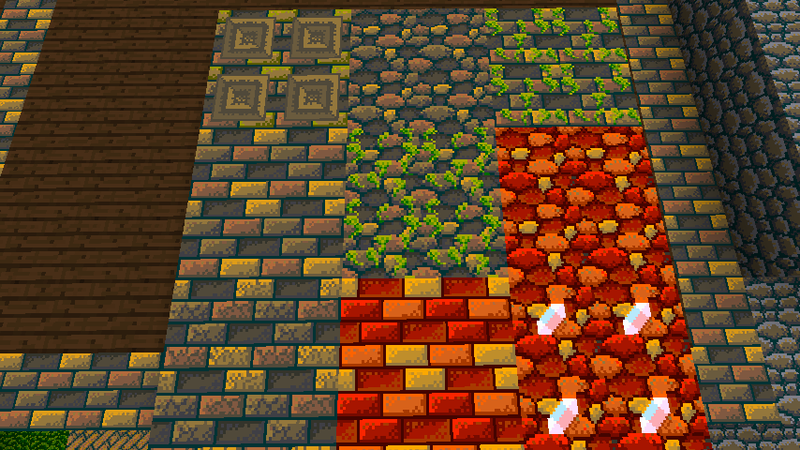 Well I had meant for them to be stonebrick and cobblestone, but I was just messing around with the palette really. I could probably get away with using the stonebrick as claybrick. Who knows what I will end up using it for lol. I've been working on this some more today. I've decided I definitely will be entering the challenge. Heres my progress so far. I've finished all the stonebrick and cobble variants, and I have started working on nether blocks. 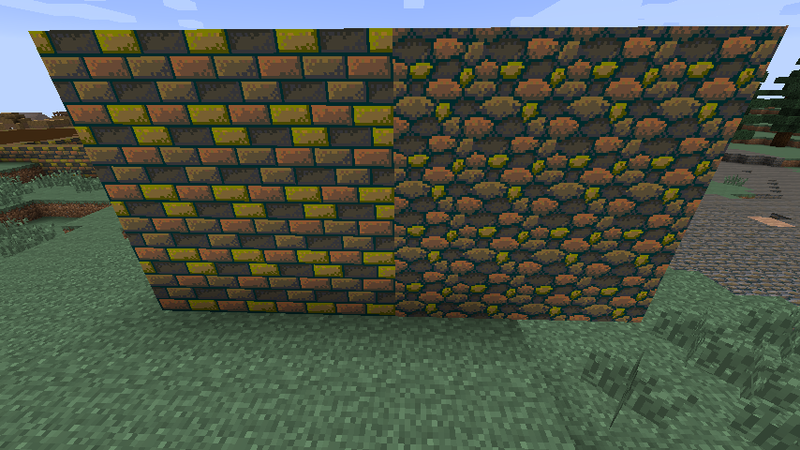 I also changed the greenish yellow brick to a yellow that better matches the other colors bricks. I dont know why so many people were upset about this palette, it seems to work pretty well in my opinion. The quartz stands out a lot. Yea I'm still working on that. The quartz is kind of in draft stage at the moment, I'm still trying to get the colors to work how I want them to. Yeah, the quartz is a representation of why this is a challenge. Our eyes burn. I'd just thought that I might want to tell you guys that you've been doing really well! Anyways... Overall, just keep up the good work! :DEDIT: I forgot the main reason I posted for: we could do with some prizes. You know, if you have anything suitable... ." :/EDIT2: And I don't mean 'GiVe Me ThE PriZeS!!!1! ', btw. I mean if you have anything that you won't end up using, or something you're willing to donate, please do. I was just about to ask if anyone is still participating in this challenge besides me and dragonoid. I'm not trying to rush people to make textures, I know I have a lot more time in the day to do it than most. I just want to know because if I'm the only one left participating then I'm just go work on my other packs. It's not a problem, I just don't want to make a fool of myself doing a challenge that's been abandoned. As far as prizes go I might be willing to let someone do a continuation of my semi-abandoned pack Petrean Kin if they win. I doubt anyone would want it though lol. Other than that all I can offer is a firm virtual handshake or an awkward virtual pat on the back. I am still in this challenge! So, is this still happening? Or has everyone left again? Aghhdknfdsfgdsidsi you're back! Me too! On a more professional note, I think I may use this challenge to get some practice in. I've been away for quite some time. I'm still in, kinda rushing and kinda not rushing certain textures.